Do you like movies? Is an IMAX Theater in your immediate future? With so many new movies coming out, if you’re a movie buff then you are definitely in luck. 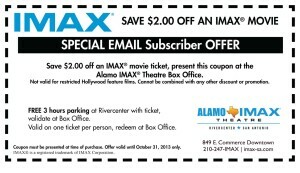 You can get a discount on your ticket when you use this ALAMO IMAX MOVIE DISCOUNT COUPON. That’s right. IMAX movies aren’t cheap. They are usually $5 or more over the usual price of a movie ticket. Yep – that much. 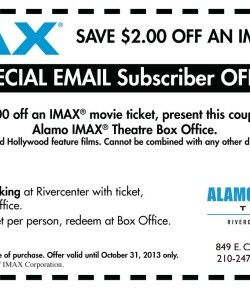 with this coupon you can save $2.00 off the price of your movie ticket. That is more money that can be funneled either into your pockets or for your popcorn. Any money saved is a great deal. Movies have gotten so expensive nowadays that you have to plan for a movie day or night out. It used to be a time when you could just go to the movies and plan on spending $10. Not any more. Movies have become so expensive, and when you add in the treats, you could easily spend $25 for one person. How about a family of 3 or 4? You’re looking upwards of $100. So, this is a great discount for you. And guess what? You also get your parking validated at the box office for up to 3 hours so you don’t have to pay. That’s a really good deal, especially in places where you have to pay for parking to watch a movie or shop. Keep in mind that you should know what movie you want to see beforehand so that you will be very prepared. And of course, since it’s a coupon, restrictions do apply. None of that matters though, because if you use it when you can, you will definitely save some money and that’s what’s important.